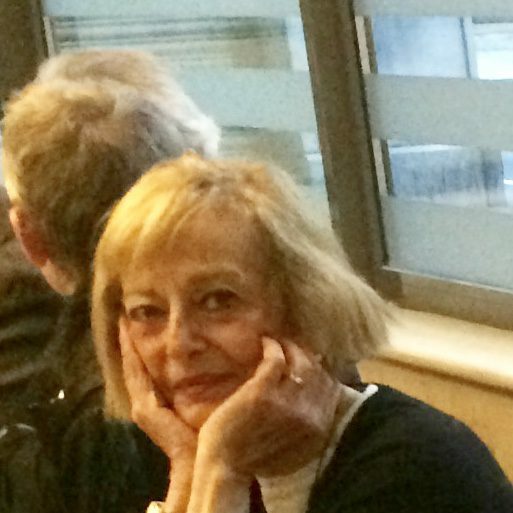 I cannot swear to tell the truth, the whole truth and nothing but the truth about lawyering because the truth is that I’m ambivalent. For one thing, the most interesting men I met but didn’t marry were lawyers. I met them in private life, though — and not in their professional capacities. Also, becoming a lawyer myself changed my life in late twentieth-century America for the better in so many ways it would take a whole essay to tell you about it. However, most of these changes were attributable to (1) the law school curriculum, which taught me how the world really works, which my liberal arts education, however valuable in other perhaps more lasting ways, did not; (2) the social status attached to professional identification as a big firm lawyer rather than as a single middle-aged woman who dabbled in writing when she wasn’t just being a mother; and (3) the independence that comes from being beholden to no one because you earn your own comfortable living, with enough left over to give your children the good education they deserve, start putting something away for old age, and then indulge once in a while in nice clothes, season tickets to whatever pleases you, travel anywhere without having to ask anyone else. That was the good stuff about lawyering. There was also what we actually had to do on a daily basis in what is referred to among lawyers as private practice. [I cannot speak for the life of in-house counsel — who I have heard actually get to go home before 7 p.m. — or of lawyers in “the public sector.”] We had to work, or be available to work, twenty-four seven. We had to represent huge corporations with big bad problems that had no easy solutions, for which said corporations were willing to pay the huge hourly fees — deductible from corporate taxes — of the armies of lawyers toiling at their behest. In the Litigation Department, we had to stall, delay. [Often for years.] File motions to remove, to dismiss, to continue. [“Continue” means to put off.] Torture the other side, and be tortured in turn, with discovery requests for roomfuls of boxed documents. Really enjoyable work. Without end. No wonder at least some of us reached the point where what was called “life-work balance” tipped too far to one side to be called “balance” at all, irrespective of the personal benefits that flowed from the really nice money, and had to sever our “commitment to the Firm.” (I still love those euphemisms.) In other words, had to flee. Then, what do you know, S. announced at the weekly Department meeting — attendance mandatory but not billable –that he had accepted a position as Environmental Director of a corporation he’d been representing as a lawyer in some tangle with the EPA (federal Environmental Protection Agency)… and would be leaving in two weeks! Alligator congratulations all around! The Firm threw him a farewell party in one of the bigger conference rooms! Lawyers from many other departments tore themselves away from their desks and telephones to gather around platters of large shrimp on toothpicks, slices of London broil, imported cheeses on imported crackers, and to imbibe at least one plastic glassful of free-flowing New York state champagne. The Department Head made a happy-sounding speech. Was it because everyone was so overjoyed S. had managed to emancipate himself with honor from the Firm? Well, maybe. Or was it because everyone hoped S. would think back favorably on the Firm in his new role as the one choosing the law firm to represent his employer when it found itself in legal doo-doo? One hand usually washes the other, doesn’t it? Two weeks later S. was gone and his office vacant, except for a few empty file folders on the bookcase shelves and the large yellow cup which had held his pens and pencils. I guess he felt he didn’t need it anymore. I can’t say he gave it to me as a parting gift. I can’t even say he told me to go take it when he circled the floor to say goodbye. I just did. I went right to his vacated office, took the cup, washed it out and kept it. I probably don’t need it anymore either. But I don’t at the moment know anyone who does. So it stays in our kitchen cabinet, alongside Bill’s Freud cup, and a third cup with sunflowers on it that I made while visiting a paint-your-own-cup workshop with two of my young grandchildren and their parents. 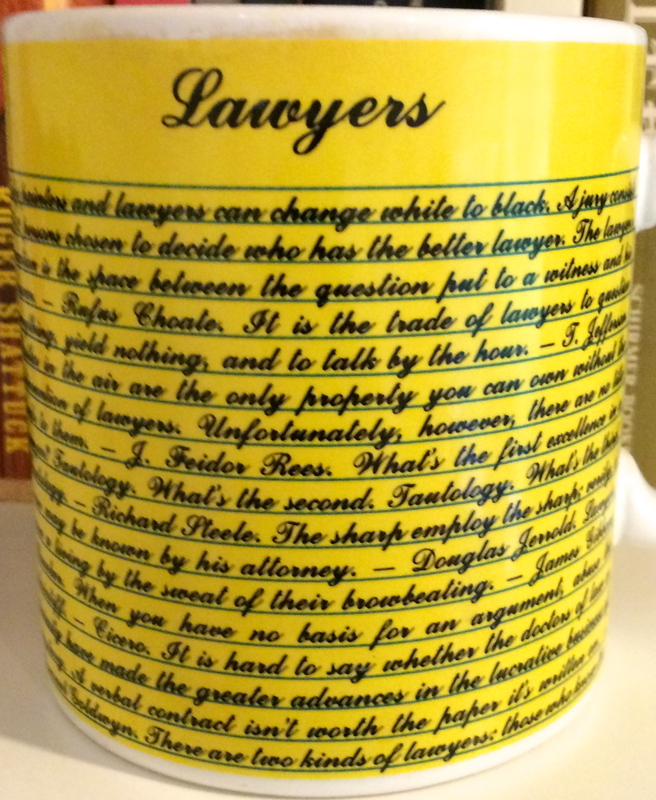 Since the cup serves no particular purpose at the moment, unless a single person comes over for coffee, in which case the guest gets the sunflowers and I take the Lawyers cup, I might as well share some of what it says with you. It’s fairly bitter, like black coffee. Which is, I know, how many people do feel about lawyers. I just wish they could remember that lawyers are people, like everyone else. That “justice” is intangible and unknowable. And that in civil court disputes, nobody wins. But if the cup speaks to you, be my guest. And if it doesn’t, it may give you a few smiles, anyway. Only painters and lawyers can change white to black. Castles in the air are the only property you can own without the intervention of lawyers. Unfortunately, there are no title deeds to them. The sharp employ the sharp. Verily, a man may be known by his attorney. 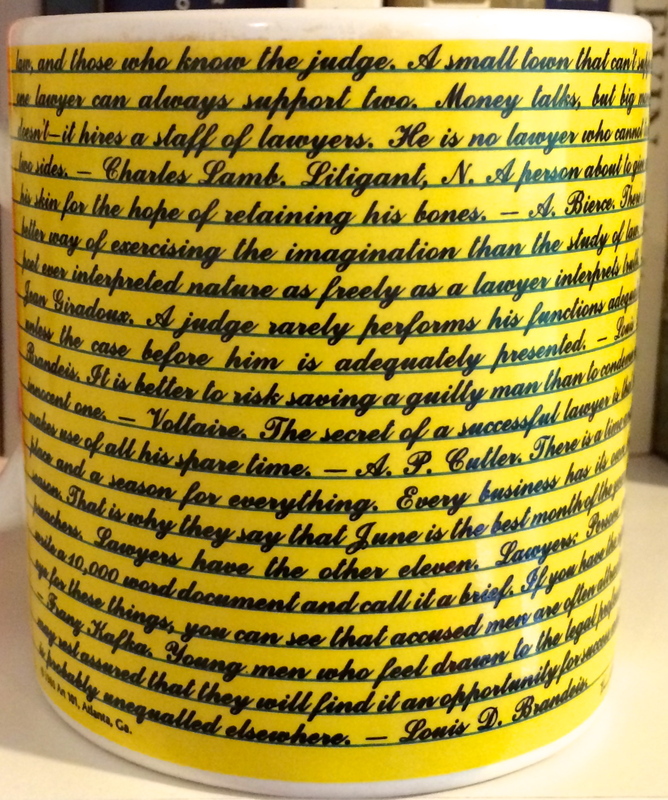 Lawyers earn their living by the sweat of their browbeating. It is hard to say whether the doctors of law or the doctors of divinity have made the greater advances in the lucrative business of mystery. There are two kinds of lawyers: those who know the law and those who know the judge. A small town that can’t support one lawyer can always support two. Money talks, but big money doesn’t: it hires a staff of lawyers. Every business has its own best season. That is why they say that June is the best month of the year for preachers. Lawyers have the other eleven. Lawyers: Persons who write a 10,000 word document and call it a brief. We’ll hear from the defense another time. My lawyer skills are too rusty right now. WHO WANTS TO READ LONG SHORT STORIES WITH ME? Thanks for the reminder of 1-3. All I see from here are the negatives. Back to my BigLaw Saturday brief-writing. Sigh. I’m so sorry. I remember those kinds of Saturdays well. Not fair!!! !